Many events involving beer happen in San Diego County and we want to be the first ones to hear about them. We are reviewing public calendar of things to do so that we can pass this information to you the beer aficinado! Shaping up to be the biggest beer gathering. 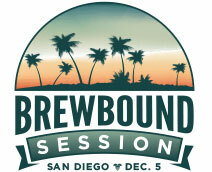 The craft brewers registering for the Brewbound Session are making it clear that they are serious about developing their breweries into successful businesses. Focused on the business side of craft brewing, the event, which will be held on December 5 at the Paradise Point Resort & Spa in San Diego, Calif., offers unmatched strategic learning and networking opportunities for craft brewers and wholesalers. 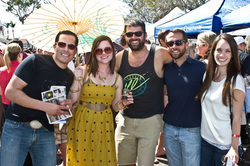 Brewfest of Encinitas - August 3th. Sample over 100 different brews including more than 40 of San Diego’s finest. Meet the beer lovers local brewers, have the opportunity to get cool merchandising items for your collection and much more. There will be Food Trucks & Seaside Cabana for your party to chill in style. Plus great music all day with local bands. And you know what ? The admission is free ! 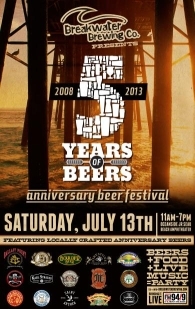 Come celebrate the 5th Anniversary of Breakwater Brewing Company with the rest of San Diego's craft beer family on July 13! They offer their own house brews, local guest brews, different regional brews on tap and casual cuisine from mouth watering pizza to priceless paninis. Enjoy your favorite sporting events on our 4 HD TV's. They are located footsteps from the sand! Come to Breakwater Brewing Company where you feel like a "local" no matter where you’re from! 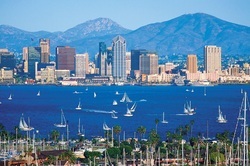 The 2013 San Diego International Beer Festival takes place June 21-23, with many breweries and hundreds of beers from around the world! This year, participants will arrive from around the world and across the country. 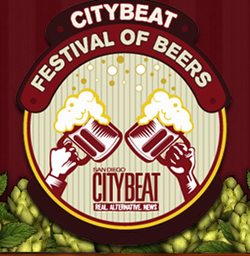 Approx 150 local breweries and over 350 beers from around the world will be participating in this Beer Fest. The winning brewery will be announced on the last day of event. Last year, Carlsbad’s local brewery, Poor Man’s IPA beer by Pizza Port was the winner. Entry to the festival gets you unlimited tasters, plus live music on the Bar Pink Stage -- all afternoon! Food will be available for an additional cost. Come join BeerNerdz and Eclipse Chocolat for a unique truffle and craft beer pairing. Enjoy the amazing and creative truffles from Eclipse Chocolat as BeerNerdz pairs them with a beer that best compliments their flavor profile. San Diego breweries will be featured as well as some international favorites. 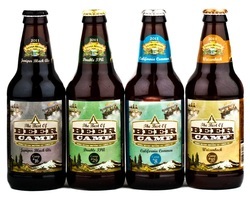 There’s even going to be a beer infused truffle featuring a San Diego brewery made specially for the tasting! Event includes 5 truffles appropriately paired with a local or international beer, a menu listing the pairings with a notes section and tips on how to taste truffles and beer. Two seating will be offered. 6-7pm and 7:30-8:30pm. Featured truffles will be available for purchase after the tasting to replicate the event at home! Every two years a highly qualified professional panel of beer judges honors the top three beers in 90 beer style categories with gold, silver and bronze awards. 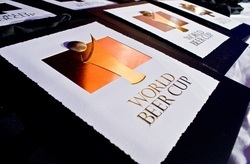 The World Beer Cup is often referred to as "the Olympics of Beer Competitions" because it is one of the very few international beer competitions awarding only one gold, silver and bronze in each category. 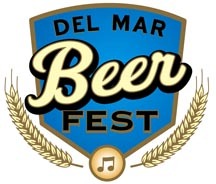 For more information and a current list of events visit SDBW.org, twitter.com/sdbeerweek or facebook.com/san.diego.beer.week. Cheers.